When my dad came home from World War II, he eloped with my mom and began a financial roller coaster that dizzied him for the rest of his life. Dad wanted to get married and finish his education – both of which required money – but he had none. Enter the G.I. bill. The Servicemen’s Readjustment Act was signed into law by President Franklin Delano Roosevelt on June 22, 1944, and was better known as the G.I. Bill. The American Legion in cooperation with the Veterans of Foreign Wars urged the federal government to provide for the approximately 12 million World War II veterans returning home who would flood the marketplace looking for jobs, and the G.I. Bill was the government’s response. The bill provided tuition and living expenses to attend high school, college, or vocational/technical schools. Low-cost mortgage loans to buy homes or start a business were included in the law as was one year of unemployment compensation. Glenn and Selma married in May, 1945 when he returned from England after the war to his small southeast Texas home town of Richards in Grimes County. He was on furlough when they eloped, and they left immediately for a honeymoon via train to Miami, Florida. The honeymoon must have been successful on some levels, although my grandmother reported that my mom called her crying, wanting to come home several times while they were gone. During those early summer months together Glenn was honorably discharged from the Army Air Corps and decided he wanted to finish the college education he had begun at Lamar College in Beaumont before the war. Not surprisingly his higher education choice was the University of Texas in Austin because he always considered UT to be the most prestigious state university. Evidently the plan was for Selma, who by then was three months pregnant, to live at home with her mother in Richards which was 150 miles from Austin; Glenn would visit on weekends. 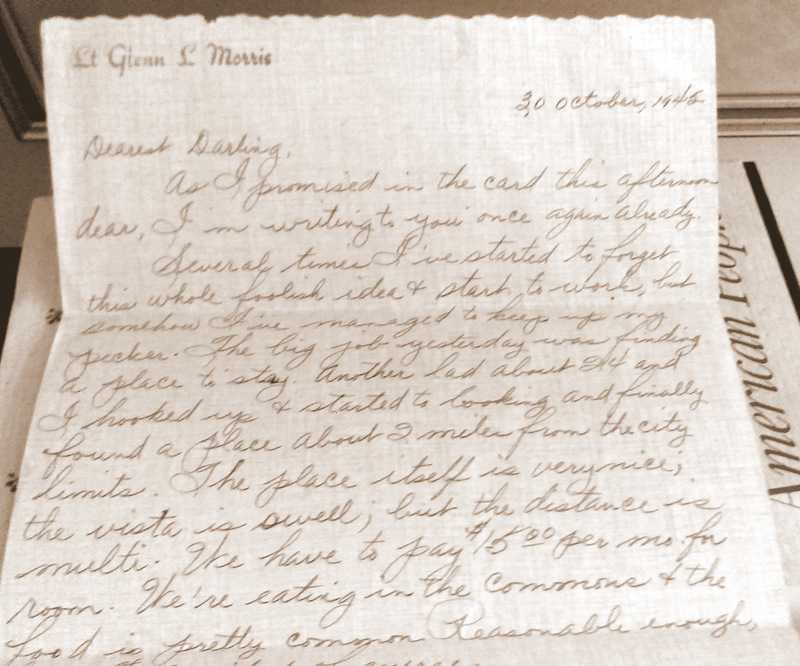 A penny post card (note it really was 1 cent) dated October 30, 1945 was the first of a whirlwind of words he sent Selma in the fall of 1945 – continuing the letter writing campaign he began when he was in the service. Just to let you know I made it all right which I did, I’m writing to you. Clever, no? I found me a place 5 miles from the college to stay. I”ll tell you about it when I write tonight. I do intend to write tonight. I’ll see you sometimes Saturday. True to his “word” Glenn did indeed write a letter to Selma on the night of October 30th. from his new digs in Austin. 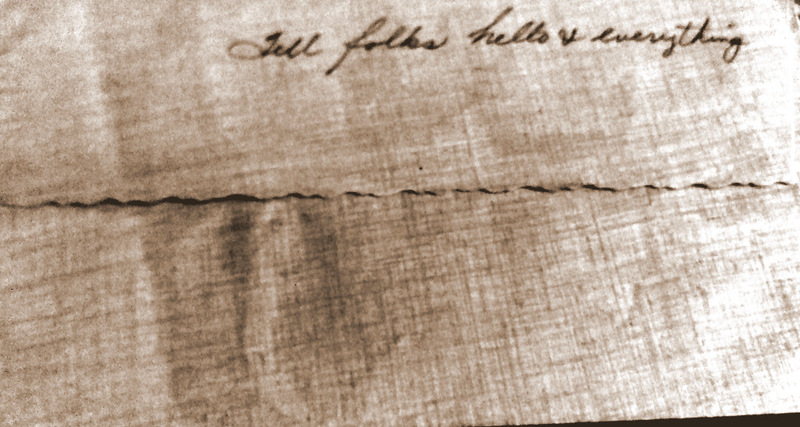 The letter was postmarked the following day. As I promised in the card this afternoon, dear, I’m writing to you once again already. Several times I’ve started to forget this whole foolish idea & start to work, but somehow I’ve managed to keep up my pecker. The big job yesterday was finding a place to stay. Another lad about 24 and I hooked up & started looking and finally found a place about 2 miles from the city limits. The place itself is very nice; the vista is swell; but the distance is multi. We have to pay $15 per month for the room. We’re eating in the commons & the food is pretty common. Reasonable enough, however. A little about my roommate. He’s an ex-serviceman. He was a pilot. He’s from Big Springs, Texas. Pretty pleasant associate. He has a Buick. Fine car. Honey, I wish there were some way that we could be together & I’ll sacrifice anything to accomplish said end, but as far as getting an apt. here…that’s out of the question. Some other place maybe. I’m already getting anxious to see you again. Tomorrow registration. Thursday, School starts. I’ll see you Saturday, lover. The very next day, Halloween, found my father writing another letter to my mother, but I will save that one for next time. 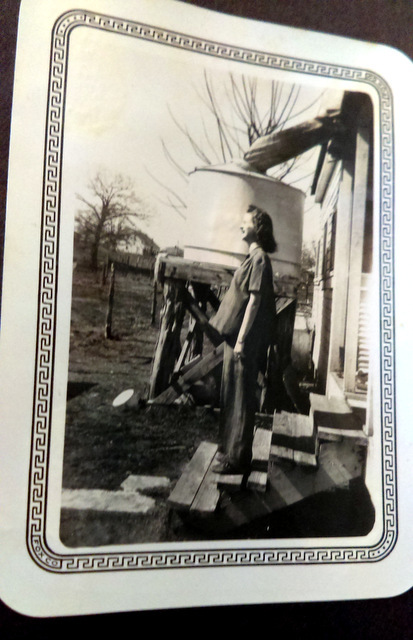 This entry was posted in Humor, Lesbian Literary, Life, Personal, photography, politics, racism, Reflections, Slice of Life, The Way Life Is and tagged gi bill, penny post cards, wwii veterans. Bookmark the permalink. Wow, he was in a rush!